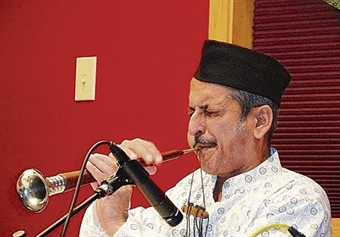 Sitar Recital By Mohsin Ali Khan, accompanied by his son Mehtab Followed by Dhrupad Recital By Ustad Faiyaz Wasifuddin Dagar Accompanied by Pt. Mohan Shyam Sharma on the pakhawaj. 06.30 PM. Venue: India International Centre, 40, Max Muller Marg, Lodhi Estate, Delhi. Centenary Birth Anniversary Celebrations of Benaras Gharana Tabla Wizard Pt. Anokhe Lal Misra National Music Festival. Flute recital by Pt.Rajendra Prasanna Followed by Parampara- Tabla trio recital by Pt.Kishan Ram Dohkar, disciple of Pt.Ramji Mishra, Rajneesh Tiwari, disciple of Pt.Chhote Lal Mishra & Dhananjay Mishra, disciple of Pt.Ishwar Lal Mishra & Pt.Chhote Lal Mishra Collab: NaadAura. 07.00 PM. Venue: India Habitat Centre, Lodhi Road, Delhi. Hindustani Classical Music Recital by Lavanya Sundaram, Disciple of Arun Kumar Chatterjee & Sarathi Chatterjee, followed by Mohan Veena recital by Chandana Bhargava, disciple of Gaurav Mazumdar. 07.30 PM. Venue: Epicentre, Apparel House, Sector 44, Gurgaon. On the occasion of Vasant Panchami, Basant & Bahar, an evening of Hindustani Classical Vocal recital by Rishi Mishra & Varun Mishra from Varanasi, Grandsons of Pt. Rajan Sajan Mishra. Collab. India World Cultural Forum. 07.30 PM. Venue: Epicentre, Apparel House, Sector 44, Gurgaon. The Ramkrishna Mission, New Delhi is organising an evening of Indian Classical Music featuring Sitar-Sarod duet by Lakshay Mohan Gupta (Sitar) and Aayush Mohan Gupta (Sarod). Accompanied on the Tabla by Ustad Akram Khan on the closing ceremony of the ongoing 150th birth anniversary celebrations of Swami Vivekanand. 05.30 PM. Venue: Ramkrishna Mission, Ramkrishna Ashram Marg, Panchkulan Marg, New Delhi. Dhrupad Recital by Pt.Nirmalya Dey. HCL Concert Series. 07.00 PM. Venue: India Habitat Centre, Lodhi Road, Delhi. IWCF Live Concert Series, Hindustani Classical recital by Gauri Guha from Canada, disciple of A. Kanan and Malabika Kanan Collab. India World Cultural Forum. 07.30 PM. Venue: Epicentre, Apparel House, Sector 44- Gurgaon. Flute Recital by Pt. Ronu Mazumder. Followed by Sitar Recital by Pt.Aloke Dasgupta. Odissi recital by Sanchita Bhattacharya. Accompanists: Sukhomoy Banerjee & Buddhadev Laha (Tabla). Venue : India Habitat Centre, Lodhi Road, Delhi. Santoor Recital by Pt.Tarun Bhattacharya. Followed by Dance duet by Tejeswini Lele (Bharatanatyam) & Rajiv Ranjan (Kathak). Accompanists: Prosenjit Poddar & Ajay Kumar (Tabla). 07.00 PM. Venue: India Habitat Centre, Lodhi Road, Delhi. Music Concert - Piano and Cello Duet. Presented by Vir�g Kiss (piano) and S�ndor Dezso (cello) from Hungary The artists will present works by Popper; Beethoven; Mendelssohn; S�ndor Dezso; Saint-Saens; and Kod�ly (Collaboration: Hungarian Information and Cultural Centre; and Delhi Music Society. 06.30 PM. India International Centre, 40, Max Muller Marg, Lodhi Estate, Delhi. Hindustani Vocal Recital by Pt. Arun Kumar Debnath, Dr.Sanghamitra Acharya & Riya Banerjee. Collab: Music Foundation. 07.00 PM. Venue: India Habitat Centre, Lodhi Road, Delhi. Music Concert by Kelemen Quartet - Barnab�s Kelemen (violin); G�bor Homoki (violin/viola); Katalin Kokas (violin/viola); and Dora Kokas (violoncello) The Quartet will present works by Mozart; Weiner; and Schubert (Collaboration: Hungarian Information and Cultural Centre; and Delhi Music Society). 06.30 PM. Venue: India International Centre, 40, Max Mueller Marg, Lodhi Estate, Delhi. Vocalist Shubha Mudgal presents music, drawing upon our secular traditions and composed by her over the last two decades and more. Collab: Sahmat. 07.00 PM. Venue:India Habitat Centre, Lodhi Road, Delhi. Sitar Recital by Alif Laila from Bangladesh, disciple of Ustad Mir Qasem Khan, Partha Chatterjee and Krishna Bhatt. 06.30 PM. Venue: India International Centre, 40, Max Muller Marg, Lodhi Estate, Delhi. Two legendary maestro's Pandit Shiv Kumar & Ustad Zakir Hussain will pay musical homage to spiritual luminary Shree Shree Anandamayi Ma! Anand Trust, a charitable organization involved in altruistic activities, brings together the legendary Maestros of Santoor and Tabla- Pandit Shivkumar Sharma accompanied by Ustad Zakir Hussain.07.00 PM. Venue: Nehru Centre Auditorium, Dr. Annie Besant Road, near Shiv Nagar Estate, Worli, Mumbai. Light Classical Vocal Recital by Onkar Nath. Santoor recital by Rajkumar Mazumdar. Hindustani Vocal recital by Pt.Baldev Raj Verma. Collab: Geetanjali Charitable Society. All day event. Venue: India Habitat Centre, Lodhi Road, Delhi. Hindustani Classical Music by Pratik Shrivastava from Kolkata, disciple of Pt. Ajoy Chakraborty and Pt. Tejendra Narayan Majumdar Accompanied by Soumen Nandy on the tabla Concerts organised in memory of the late Amar Mishra(Collaboration: Jnana Pravah) . 11.00 AM. Venue: India International Centre, 40, Max Muller Marg, Lodhi Estate, Delhi. Subah Ki Swaravali (Morning Ragas) - Hindustani Classical Vocal by U. Raja Mian Khan (Agra Gharana) Accom: Sriniwas Acharya (Harmonium) & Girish Nalavade (Tabla). Followed by Listeners' Club Class Room No. 004 9.30 A.M. An Audio-visual show on Legendry Sitar Player Bharat Ratna Pt. Ravi Shankar Conducted by Suresh Chandvankar Co-ordinated by : BCCA. 06.30 AM. Venue: Bhavan's Cultural Centre, Bhavan's College, Munshi Nagar, Andheri (West), Mumbai.